Tiger Muay Thai and MMA training camp, Phuket, Thailand fighters racked up a 3-1 record over two nights of Thai boxing fights in Phuket, Thailand on September 30 and October 2, 2010. 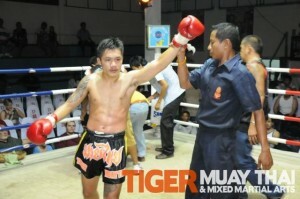 On September 30 at Patong Thai boxing stadium is was return guest Robert scoring a huge KO over Muay Thai veteran Tonphet. Robert took some hard leg shots early before unleashing his hands and KO’ing Tonphet in the 2nd round. JoJo, also on the fight card, scored a 2nd round KO over his Thai opponent extending his unbeaten streak to 4 fights and 8-2 over his last 10 fights. On October 2, 2010 at Bangla Thai Boxing stadium, it was Ritt winning by TKO in the fifth round while Nong had his win streak broken at four fights with referee stoppage in 2nd round.